I reckon my little girl have somewhere in the region of 150 hairclips and ties... It's excessive, I know, but I just can't help myself, especially now that I have started making button clips (and anyway, she loses them so often that I can kind of justify it). Anyway, I have been thinking about making her a hairclip holder for a while now, to keep things organised and pretty up her room a bit. I still haven't gotten around to making my daughter one but I did whip up one for my friend's daughter's first birthday this weekend. The design and construction was very simple. 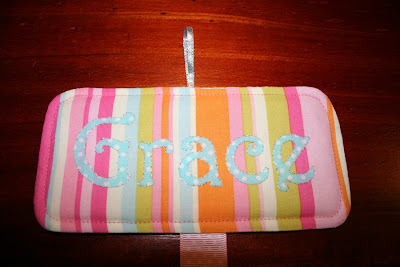 I trimmed a scrap of fabric from Sandi Henderson's Farmer's Market collection (just love the colourful stripes) into a plaque with rounded corners. I then found a font that I liked (I think it's called Harrington) and sketched it directly from the computer screen onto some aqua polka dot fabric. After ironing on some vliesofix I cut out the letters and fused them to the fabric plaque. I finished it off by back-stitching around it using fine silver embroidery thread. 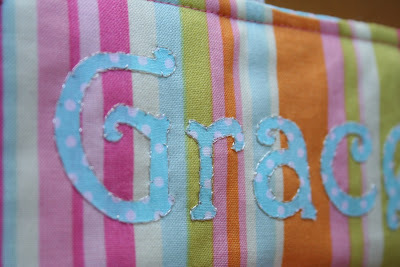 The plaque is backed with the same aqua polka dot fabric and has a medium fusible fleece inside to give it a bit of structure (otherwise the weight of the clips would cause it to sag). It's finished with a topstitch around the edges. 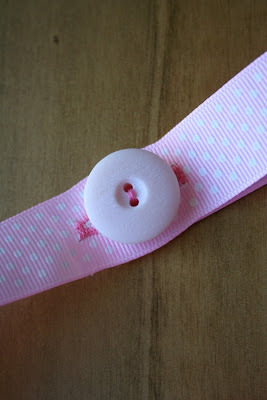 I used pale pink grosgrain ribbon to attach the clips to and sewed a button and buttonhole at the bottom to attach the hair elastics. Of course I made a dozen or so button clips and ties too! 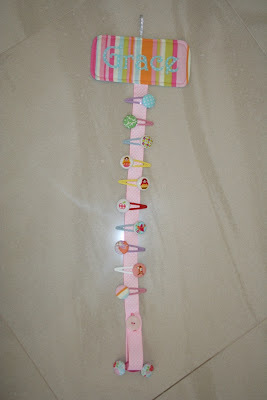 Now I just need to make one for my little girl.